Kelly Gay: Lost dog! If you live in/near Vancouver/Whistler, BC . . .
Lost dog! If you live in/near Vancouver/Whistler, BC . . .
EDITED: CLEO HAS BEEN FOUND!! YAY!! 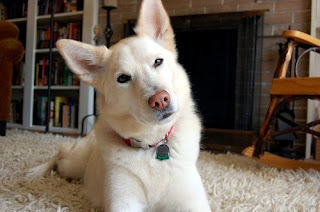 (via Colleen): "Writer Kim Werker's beautiful dog Cleo has run off, spooked by the sound of the avalanche-explosives. If you live near the Vancourver, BC area, can you please help her look for her dog? Edit to add: Tracks seen northbound Hwy 99 (past Emerald, Whistler BC)." Thank you so much for posting about Cleo, Kelly! I'm from Vancouver, but we're spending time in Whistler, which is about 2.5 hours north of the city. No problem. I wish I was up there; I'd put on my boots and help you look for her. I hope you find her safe and sound! Update: Cleo has been found!!! YAY! I'm so glad Cleo has been found! She is a beautiful dog.